Allahabad’s PM 2.5 levels have almost doubled in the last two years. In 2016, its PM 2.5 has increased to 170 ug/m3. In 2014, it had a PM 2.5 level of 88 ug/m3. New Delhi: Delhi is no longer the most polluted city in the world, shows data released by the World Health Organization (WHO) on Thursday. From the No. 1 position in 2014, the national capital now ranks at No. 11 on the list. The ranking, prepared on the basis of the quantity of particulate matter (PM) under 2.5 micrograms found in every cubic metre of air, shows a substantial decline in the amount of PM 2.5 in Delhi. While the annual mean of PM 2.5 in the data released in 2014 was at 153 ug/m3, it declined to 122 ug/m3 in 2016. The WHO’s urban air quality database in 2016 includes 3,000 cities in 103 countries. The number of cities that measure their air pollution levels has increased from 1,600 across 91 countries in 2014. In more good news, the number of Indian cities in the top 10 has dropped from six in 2014 to four. Ahmedabad and Lucknow have exited the top 10. However, Allahabad has entered at the third spot. “Delhi has adopted some important measures which have led to improvements in air quality. The Euro IV emission standards were introduced in 2010, which are beginning to show results now. In the last two years, actions have been taken like not allowing pre-2000 trucks to enter the city. Rajghat coal-based power plant has been shut down and construction sites are also under strict check. Building public opinion around the issue has played an important role," said Anumita Roy Chowdhury, executive director-research and advocacy at the Centre for Science and Environment. However, all is not well. Smaller cities are registering much higher levels of air pollution. For example, in Allahabad, PM 2.5 levels have almost doubled in the last two years. At 18th place in 2014, it had a PM 2.5 level of 88 ug/m3 then. In 2016, its PM 2.5 has increased to 170 ug/m3. Cities like Ludhiana, Kanpur and Agra also show a substantial increase in PM 2.5 levels. Particulate matter is associated with adverse health effects. The smaller the particles, the deeper they penetrate into the lungs and cardiovascular system, posing great risk to health, leading primarily to non-communicable diseases such as stroke, heart disease, lung cancer, and chronic and acute respiratory diseases, including asthma. “Learning from the Delhi experience, the government should formulate a national air quality, planning and action programme. It should insist that states roll out time-bound action plans to reduce air pollution," said Roy Chowdhury. The Delhi government, quoting scientists at the Delhi Pollution Control Committee, said air pollution had decreased in the past year due to increased awareness about pollution-related data in the public domain, concrete action to control emissions from construction activities and control on industrial emissions. 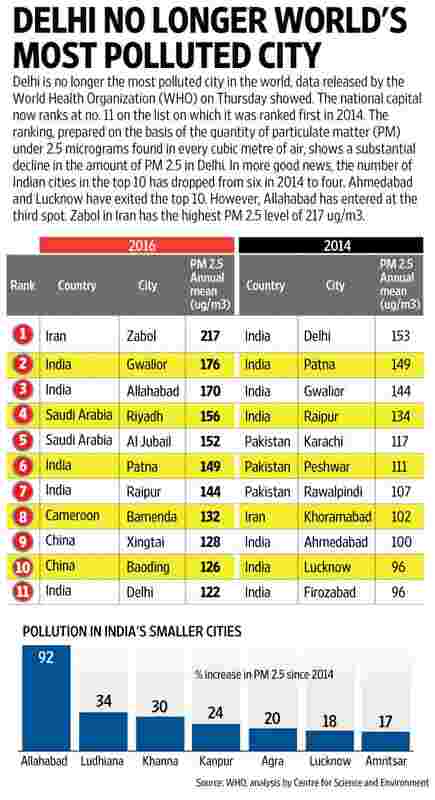 India fares better in PM 10 levels. Only Gwalior figures in the top 10. In 2014, three Indian cities—Gwalior, Raipur and Delhi were in the top 10. Zabol in Iran has the highest PM 2.5 level of 217 ug/m3 while Onitsha in Nigeria has the highest PM 10 level at 594 ug/m3. Sinclair in the US is the least polluted for both PM 2.5 (2 ug/m3) and PM 10 (3 ug/m3). Global urban air pollution levels increased by 8%, despite improvements in some regions. More than 80% of people living in urban areas that monitor air pollution are exposed to air quality levels that exceed WHO limits. While all regions of the world are affected, populations in low-income cities are the most impacted. According to the data, 98% of cities in low- and middle-income countries with more than 100,000 inhabitants do not meet WHO air quality guidelines. However, in high-income countries, that percentage decreases to 56%. “Air pollution is a major cause of disease and death. It is good news that more cities are stepping up to monitor air quality, so when they take actions to improve it they have a benchmark," says Dr Flavia Bustreo, assistant director general-family, women and children’s health, WHO. “When dirty air blankets our cities the most vulnerable urban populations—the youngest, oldest and poorest—are the most impacted," she added.